When Shark appears during a shooting for an underwater TV show, everyone becomes scared and swims away. Poor Shark meant no harm. He was just trying to help. For example, someone's bleeding and Shark only wants to give them a band-aid. It's hard being a misunderstood shark because everyone is instantly filled with fear just at his presence. As the interviewer talks to Shark and tries to understand what he's doing, his staff shares shark facts with the viewers. In the end, can Shark really be different from the others? 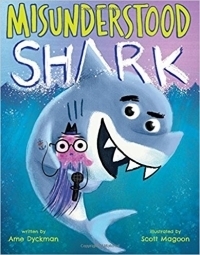 The illustrations in MISUNDERSTOOD SHARK are bright and colorful. I love that there's humor in this book, along with educational facts about sharks. For example: "Sharks can grow and lose 30000 teeth in their lifetime". This was such an intriguing fact that I never knew about! I guess that's why people find so many shark teeth. Final Verdict: I would recommend this book to children who like sharks, fun facts, and humor.